If you’re thinking of taking your base layer to another level, one of the world’s leading skiwear companies Patagonia say that their Capilene® Air baselayers are their warmest and most advanced yet. Paragonia pioneered the concept of layering – now proclaimed as THE way to keep warm on the slopes by pretty much everyone – decades ago and has been innovating ever since. The Capilene® Air baselayers are exceptionally lightweight and incredibly soft, produced using a blend of 49% recycled polyester and 51% finest merino wool from New Zealand. Gear Patrol are asking if this is the best baselayer ever? Available in a range of colours, both tops and leggings for men and women the range provides temperature regulation and moisture management thanks to the material offering exceptional breathability and the natural odour-fighting properties of wool, improving wicking durability and dry times compared to conventional merino baselayers. 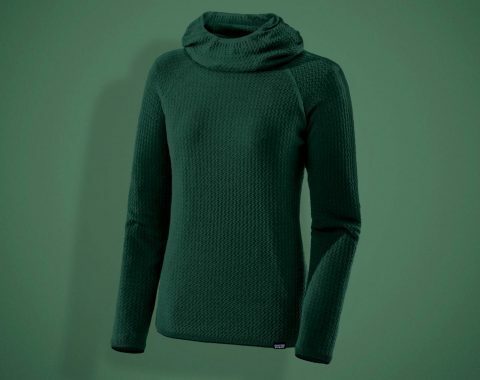 The tops feature a high collar and self-fabric hood with anatomical shaping for warmth and the garment is made with a soft, stretchy, elastic knit into cuffs and hem for added recovery and comfort over extended use. As it’s designed to be worn next to the skin the fact that the baselayer features a seamless 3D structure like a giant sock for nearly weightless warmth and increased airflow with minimal material waste in the creation process.